With a population of about 335,000 residents, the City of Vaughan has been one of the fastest-growing communities in Canada and continues to be an emerging world-class place to raise a family, start a business and enjoy many attractions and amenities. It is anticipated that by 2031, Vaughan will grow to more than 416,000 people and 266,000 jobs. It is home to more than 12,000 businesses that employ more than 222,000 people. The quality of life is unrivalled. 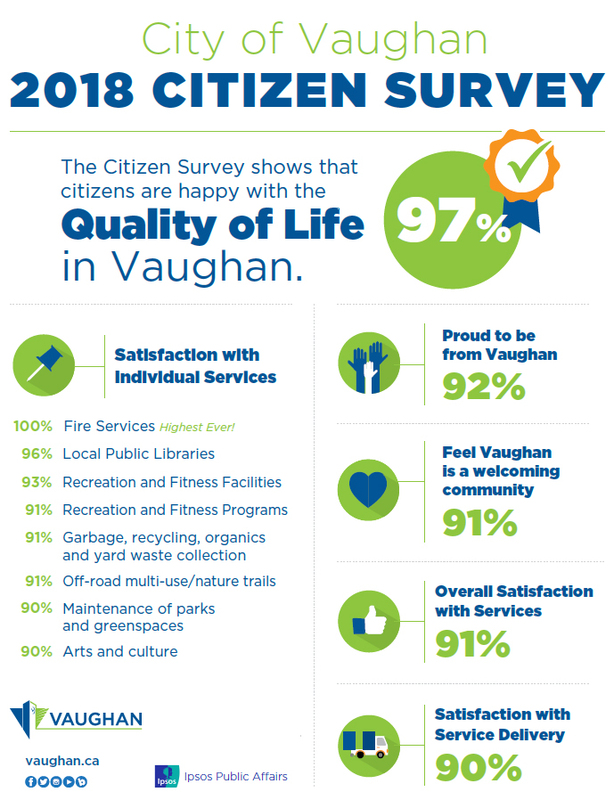 In fact, the results from the 2018 Citizen Satisfaction Survey reveal 97 per cent of residents agree the quality of life is good here. The 2018-2022 Term of Council Service Excellence Strategic Plan serves as a map to guide the City through the next four years. Each four-year Term of Council Service Excellence Strategic Plan incrementally contributes toward the achievement of the Vaughan Vision. This plan builds off the 2014-2018 plan, continuing the alignment of people, priorities, processes and technology. It outlines Vaughan’s Vision, Mission and Values and identifies the strategic key activities that staff will focus on to enable the execution and implementation of projects related to Council’s commitments to the citizens of Vaughan. The Strategic Plan is divided into nine strategic priority areas: transportation and mobility, city building, environmental stewardship, active, safe and diverse communities, good governance, citizen experience, operational performance, staff engagement, and economic prosperity, investment and social capital. Six of the strategic priority areas are primarily reflective of Council’s objectives and three are the Service Excellence objectives, and each articulate the outcome that is to be achieved at the end of this Term of Council with clear, focused and measurable performance results. The 2018-2022 Term of Council Service Excellence Strategic Plan is aligned with the 2019 Budget and 2020-2022 Financial Plan and will position the City to deliver on Council-approved priorities while continuing to keep the tax rate increase among the lowest in the Greater Toronto Area.